All Honest users possess their Bitcoin Cash private keys. Your private keys are derived from something called a "mnemonic", "recovery phrase" or "seed" (used interchangeably) which is a string of words generated randomly. Honest does not have access to your private keys - we only store an encrypted version of your mnemonic to our server. Your mnemonic is encrypted with your password that we never see. We recommend every user back up their mnemonic or private key to make sure you can still access your funds in the event of an emergency, such as forgetting your password. Your mnemonic and private key can be backed up on the Honest Wallet page. 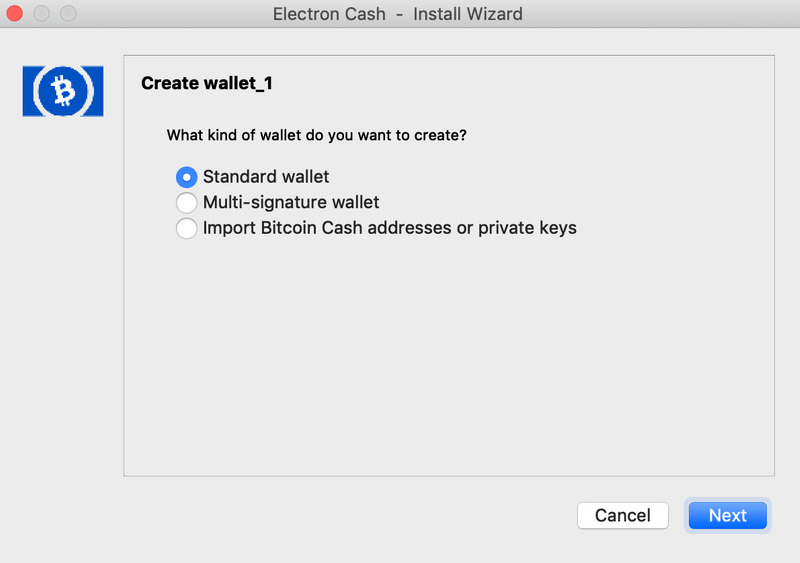 It is possible to import your Honest wallet into Electron Cash, a multi-platform Bitcoin Cash wallet. Here's how you do it. First, be sure you are logged in, then get your mnemonic from the Wallet page. 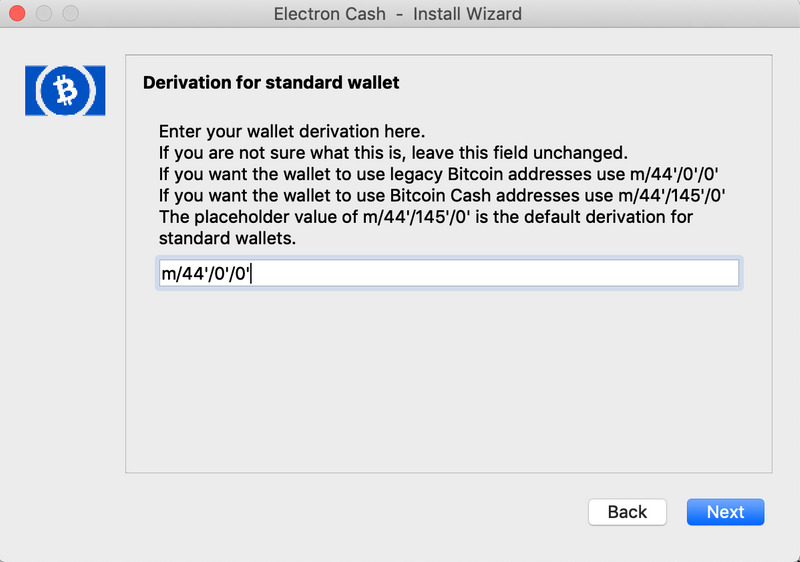 When you run Electron Cash, it will either ask you to create a wallet when you first run it or if you already have a wallet, you should go to the "file" menu and click "new/restore". 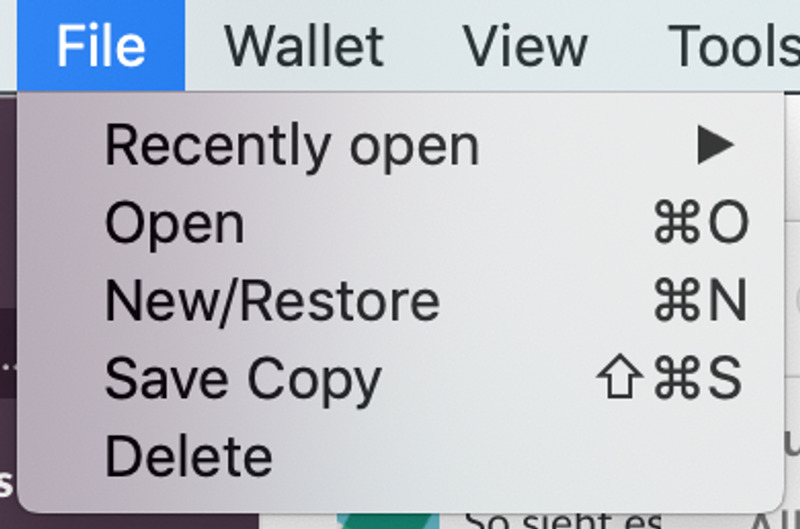 In the wallet creation window, type in a name for your wallet. It's a good idea to put "Honest Cash" in the name so you know that it refers to your Honest wallet. Then choose "I already have a seed" and type in your mnemonic. Next, change the path to the original path type. The path should be m/44'/0'/0'. 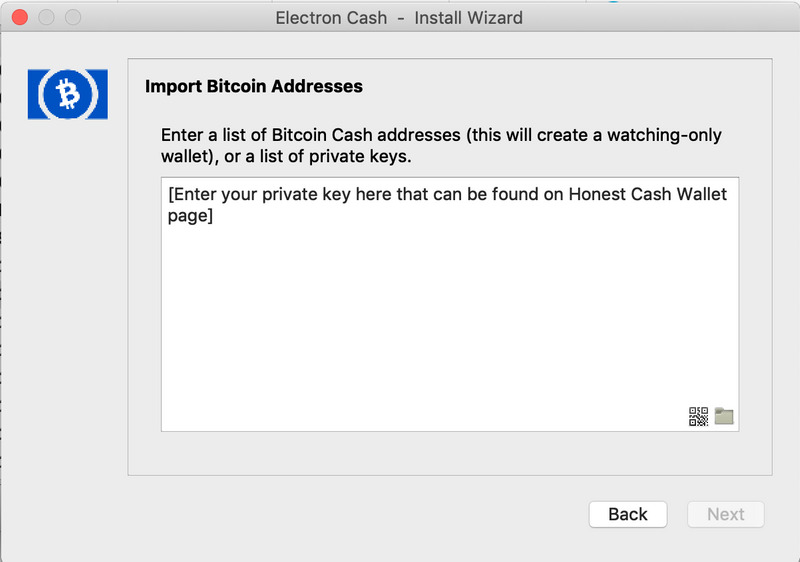 Next, choose "Import Bitcoin Cash addresses or private keys" if you want to import your private key. Next, insert an optional password to encrypt your new wallet. We recommend encrypting your wallet with a password. Next you will see your wallet. It will take a few minutes to synchronize. 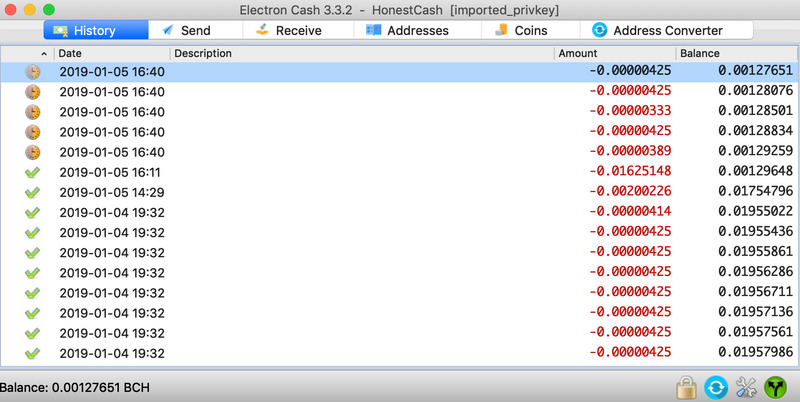 After it synchronizes you will see your full balance and all your Honest transactions in Electron Cash. Note that Honest currently uses only the first address on the BIP39 wallet, derived from the recovery phrase. The full derivation path for the Honest wallet is: m/44'/0'/0'/0/0. 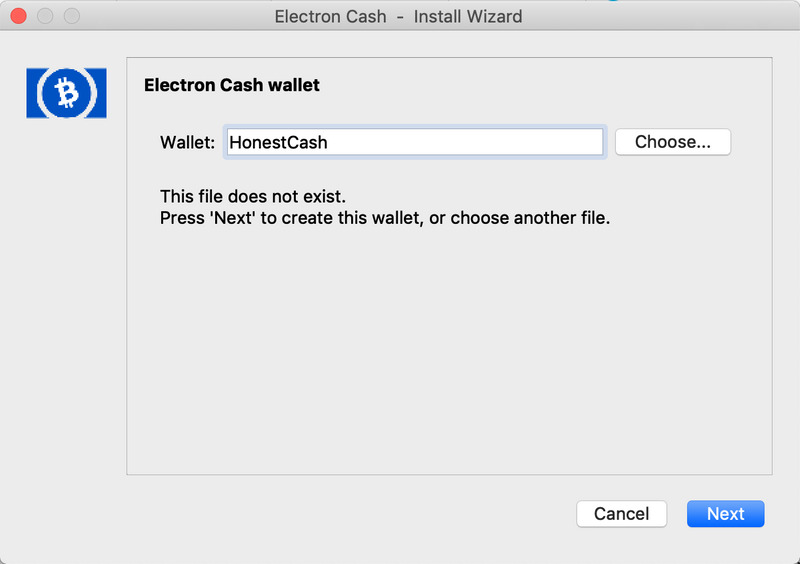 If you send transactions in your Electron Cash wallet, they will not show up in Honest. 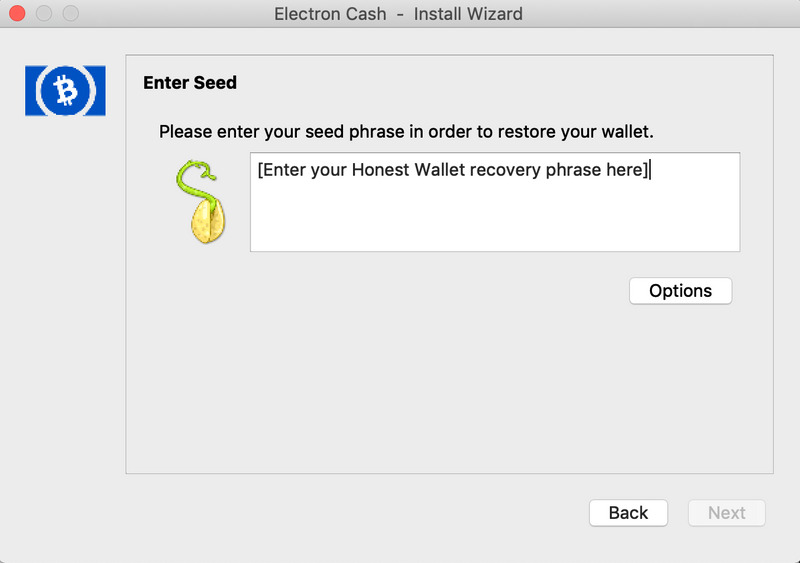 We recommend using Electron Cash to restore your Honest wallet only if you cannot access the funds on Honest itself. If you have problems, please contact info@honest.cash. How to import your Honest wallet into Bitcoin.Com wallet? I am starting to get overwelmed by all the wallets. Would be nice to have one for all my accounts. That is the whole point of BIP44. One master phrase lets you derive all of your wallets across all coins and all accounts. But no one is using it properly. Coinomi has a good multi-coin wallet they support around 30 different coins and you can manually add ECR-20 tokens if they are not included. I moved my wallet from mycelium to Coinomi when the BTC/BCH split happened and have not looked back. If you are wanting to have multiple seeds in one wallet it does not allow for that. So you would need more than one wallet to do that.